Cedar Lodge a luxury retreat is the perfect venue whether you are looking for a peaceful getaway, a family reunion, or business meeting retreat. This rustic but elegant lodge is a comfortable refuge for business brainstorming and planning or just to escape the stresses of today's hectic life styles. Cedar Lodge is a 7600 sq. foot estate that make you feel welcome with an amazing collection of antiques and collectibles. The luxury accommodations of 7 bedrooms sleeps 20. Enjoy the panoramic view of the shimmering lake Loch Lomond while enjoying a glass of wine or your morning coffee from one of the several decks or the screened in porch. I manage Cedar Lodge Arkansas in beautiful Bella Vista, Arkansas. My husband, Dave, and I bought the property in 2006. 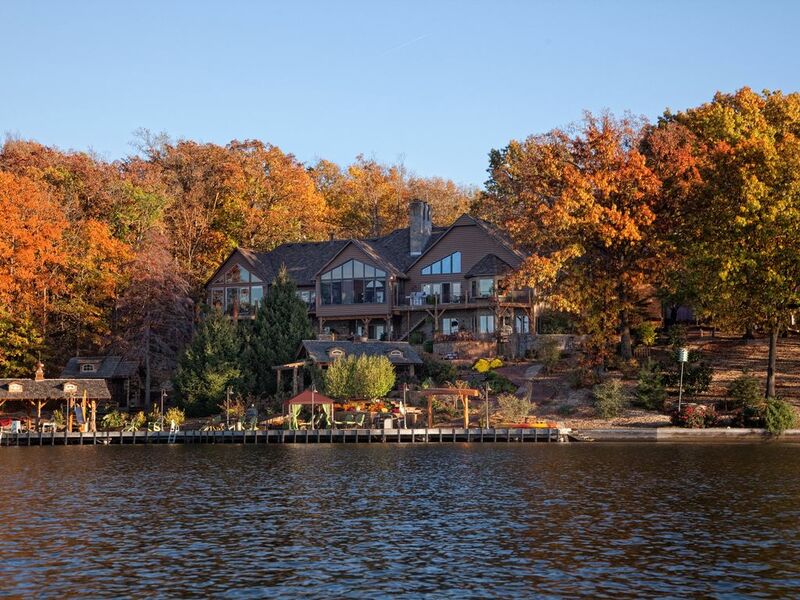 Cedar Lodge is a magnificent lakefront property nestled in the Ozarks in Northwest Arkansas. My goal to is make this a rustic but elegant lodge, a comfortable refuge whether you are looking for a peaceful getaway, a family reunion, golf retreat,or business meeting. Dave and I have been blessed with a wonderful family, including 3 daughters, 1 son and 6 grandchildren. We love the beauty of the Ozarks and enjoy sharing it with family and friends. We have always enjoyed the outdoors and took our family camping for many years. When my husband retired we fell in love with this lakefront property, my love of the trees and hills, and his love of the water were a perfect fit. We truly believe Northwest Arkansas is a paradise. Many guests don't want to leave Cedar Lodge once they get there, but if it is activities you are looking for, we are only 10 minutes away from several golf courses, 20 minutes from the world famous Crystal Bridges Art Museum and Sam Walton museum. 20 to 30 minutes away is many choices of shopping and restaurants. The area is filled with hiking and biking trails and a river to kayak to enjoy the beauty of the Ozarks. Dinning in Kitchen round table fits 6, have squeezed 10 around, Dining Room round table fits 6, casual seating in hearth room. Pond and waterfall in front of house, gardening front and back, Fire pit, outdoor cabana with fireplace, large dock, horseshoes, shade arbor on dock. LIFEJACKETS REQUIRED, SOME PROVIDED SUGGESTED TO BRING YOUR OWN. In Bella Vista, must have guest pass. Lake is more fun. Lakehouse on beautiful Lake Loch Lomand, 15 min from Bentonville, and the Crystal Bridges, Amazeum, and Walmart Museums, River floating,catering, new hiking and bicycling trails. This place is over the top. Our families had a great time at Cedar Lodge. We loved all the extras like the hot tub and Sauna and the incredible outdoor spaces and all the downstairs fun like pool, foosball and the huge movie screen. The bedrooms are incredibly relaxing and the kitchen and dining areas made family time a wonderful experience.There is so much to see and every time you enter a room you discover something you hadn't seen the last time. The owners made sure we had everything we needed and were so wonderful to us! WE LOVED IT! Larry thank you for your kind words. We love hosting families. Our wish is that you are blessed with many happy memories. My son was married at nearby Cooper Chapel and we chose Cedar Lodge as the place to house both families and have the wedding reception. It couldn’t have been anymore perfect. The lodge is absolutely gorgeous. There was not one thing that we needed that the owners didn’t provide. This place was so equipped, my only concern was getting everything back to its original place. The lodge is massive with extra ammenties like a toy closet, a drop down projection screen, a total game/bar area, and a massive kitchen. Each bedroom was unique in its set up and decor, you could spend a couple hours just admiring the place. Pictures don’t even do this place justice. The outside areas are just as amazing as the inside. Several fire pits, tons of deck space, all kinds of water activities to enjoy, and a view that is picturesque. We could not have ask for the owners to be more kind or helpful. We can’t wait to rent this place out in the summer to enjoy it in warmer temperatures (but we loved it in March too!). Truly a perfect place for any kind of family gathering or event. Well worth the money with space for everyone. Absolutely AMAZING!!! You’re Place is so beautiful and so relaxing. This is our Family’s 3rd stay here. It is the most wonderful and relaxing place. The Host Sandra thinks of everything to make your stay special!!! Thank you again!! We absolutely loved hosting our employees for a staff retreat here. Sandra is wonderful at communicating and so helpful with details needed as far as tables and chairs. The home is cozy, comfortable, full of character, spacious and so well-kept. There was so much space to gather our large group, but also opportunity to break away on the property for alone time. We can't wait to host our group here again! We were restored and filled with joy to share a wonderful weekend at this beautiful home. It was a Girl's Weekend filled with women from 25 to 89. We felt like kids again as we laughed, played, and danced all weekend. Our souls and hearts were filled to the brim. Bella Vista Cabin is truly one-in-a-million vacation rental. We are grateful to the owners for sharing this lovely home with our family. We spent 4 days at Cedar Lodge for my daughter's wedding. The Berry's house was perfect! It was an amazing location and had incredible amenities. We were able to comfortably fit the family and all of her bridal party for the wedding. The lodge is exquisitely decorated and inviting. I will be planning our return during the summer to enjoy the lake and the outdoors! We are so happy you enjoyed the lodge. We love having families stay and we hope the bride and groom have a very blessed lifetime together. Beautiful Lake Retreat with many many choices of restuarants and shopping within 20-30 minutes. World famous Crystal Bridges Museum 15 minutes away in Bentonville. Pinnacle Hills Shopping Mall 30 minutes away in Rogers. Sam Walton Museum. Rates are subject to change until reservations are confirmed. Maximum occupancy of the home is 21 guests.